Of course every icosahedron jawbreaker trap needs a respectable stand. Here is a very simple one I made in Tinkercad. 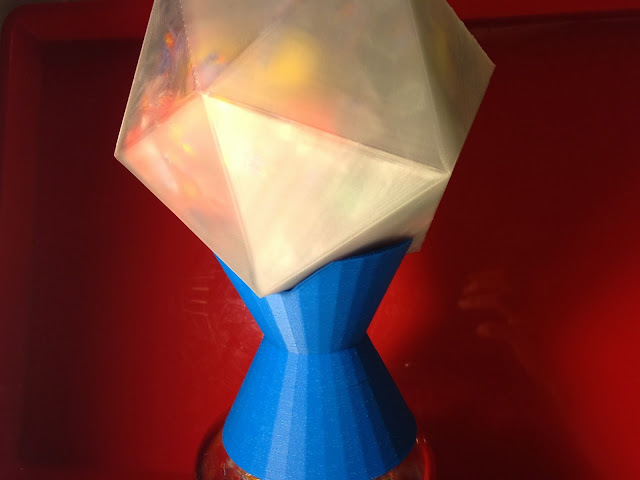 Its top is exactly the shape needed to hold the icosahedron and we filled it with rice as it printed so it would be sturdy. Settings: Afinia 3D software with .3mm shell on normal, 1 hour and 21 minutes. Stuff you might want to change: I printed this as a shell since I thought it would be the fastest and because I wanted to put rice inside of it for weight, but the model has a flat horizontal triangular region near the top that did not print well. If I made this again I would print it with a very loose fill and just add the rice inside the fill cells.